Les Diablerets, a traditional village, offers skiing to 3000m (including summer) hiking/walking, tennis, swimming and golf in summer. a 3 storey demi- chalet in a sunny garden. 3 bedrooms, 1 bath, 1 shower, kitchen, dining room and living room with open fire. There are 2 balconies and a terrace. Double garage has ski storage area. Resort details: The chalet is 1 1/2 hours (road or rail) from Geneva. 12 hours by car from London. Centre of 3 ski regions between Gstaad and Villars. More than 50 ski lifts near by, all standards ski school. Beginners / infants to expert black runs off Glacier and Villars. Diablerets Glacier (lift 2 kilometres from Chalet) is open all summer at 3000 metres. Cross country and downhill. Para gliding, tennis, swimming and golf (7 courses within 1 hour). We live in the UK and have been visiting Les Diablerets for over 50 years. When you go there you will understand why. We drive out 4 times a year and the rest of our family fly out to join us from time to time. Skiing is a great family sport and holiday we hope you will enjoy our chalet as much as we do. In Summer I play Golf in the Valley (Crans-Montana) and up on the Alps at Villars My children like hiking over the mountains in the summer and sledging in the garden in the winter. we love peace and quiet with the quality of living that Les Diablerets offers us. We hope you do too! Chalet Royal is a fantastic rental. It is next to the Navette stop (the free ski bus) which takes you to the ski lifts (1 stop Glacier 2 stops Isenau and the Gare (station) is so useful for shopping or going skiing without the car when the roads are icy or different family members what to do different hours. The garden is great for sledging and playing in summer and winter. The views are spectacular and the scene ever changing with the weather. The Terrace has the sun until the last moment in our ideal location. The chalet bedrooms are large with good wardrobes. The Sitting room and Kitchen open plan with an open fire for great family gatherings and games. Hot water is limited in all Swiss chalets. We have a especially large hot water tank of 300 litres, which because of local regulations is only heated at night. This is sufficient for daily washing requirements for 6 adults. Chalet Royal has a Bathroom : Bath with Shower over & with WC A separate Shower on the top floor A separate WC on the ground floor. 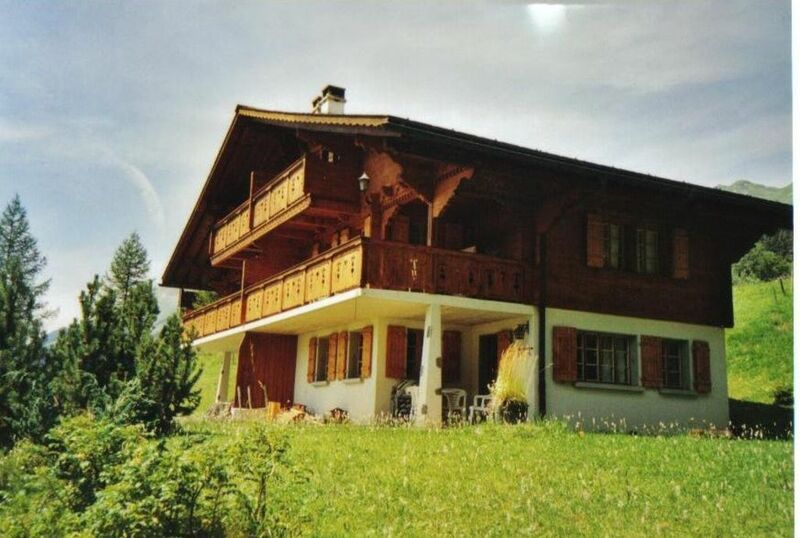 The accommodation is over three floors comprising one half of a chalet. The chalet was built for use by local Swiss and is finished to a substantially higher level than normal holiday accommodation. With 125sqm or 1300 sq feet inside, a garden of 1,000 sqm (11,000 sq feet), an enormous double garage and off road parking for two cars, there is plenty of space for all. Built on the south-facing and sunny slope above the village centre, the chalet is well separated from surrounding chalets. Views are spectacular, up to the Diablerets glacier and across the valley to the Meilleret/Villars ski area. Access to the village centre and various ski areas is available for those without cars through a free local bus service. A bus stop is less than 100 metres from the chalet. Family friendly quiet and unspoiled Swiss mountain village full of traditional chalets. Range of local restaurants and food shops in Les Diablerets based on the traditions of an eco friendly farming community. For further details, do not hesitate to contact owner. Ski: 3 main areas Isenau up to 2120m, Meilleret (linked with Villars) up to 2120m and Diablerets Glacier 3000m. All areas linked by free ski bus.